When building your product inventory you want quality cabinets and accessories to offer your customers. SEKD offers 8 stock lines of framed and frameless cabinets along with sinks, bathroom vanities, cultured marble vanity tops and more. Working with Southeast Kitchen Distributors has been great. From the ordering process, to receiving the products on time so I can make sure my jobs start on time. A+ company with very helpful employees. Good quality products and their customer service is excellent. Southeast Kitchen Distributors is second to none. Just wanted to say ‘Thank you’. The employees with Southeast Kitchen Distributors are not only knowledgeable on the products but also very friendly. I would definitely recommend them! "Great Cabinets at Affordable Prices"
Southeast Kitchen Distributors (SEKD), a subsidiary of The Floor Suppliers Inc., is a family run business and has been established since 2004 in Melbourne, Florida. We are originally from the Caribbean and have been in the Industry since 1949. Our customers mean the world to us. We have always chosen the path of providing quality customer service; thus making the customer experience, a happy one. This has kept our company successful for decades and we, together with our staff, have been trained to continue on the same path…always striving to give quality service to our customers. SEKD is a licensed cabinet distributor offering affordable all wood cabinets to wholesale distributors and dealers throughout the Southeast United States. Currently, we offer 8 stock lines of framed and frameless cabinets featuring all plywood construction, finished interiors, and dovetail drawers with full extension soft close slides, in multiple styles and finishes. We have the ability to provide any door style, species and finish, including custom pieces and sizes for special projects. Our products are available throughout the Southeastern United States through various dealers and distributors, and as a kitchen and bath product distributor we know that every project is different. Furthermore, since we understand that every project is different we offer the ability to provide any door style we carry in any finish in custom sizes, customized for any special projects a client will be working on. We offer knowledge and expertise for every degree of consumer, we can offer advice from the start of a project to completion. We are committed to your success, and offer a great opportunity to become a top distributor in your area. We currently offer 8 styles of framed all wood cabinets, cabinet hardware, a variety of kitchen sinks, and accessories. Our products are long-lasting and efficient in their use of space. We are always researching the latest techniques and trends to be sure clients are given a larger amount of choices for cabinets, drawer boxes, door styles, finishes, accessories, and other products. SEKD is dedicated to; timely, helpful, trustworthy service and availability of products. The foundation of our company is built on the belief that establishing and maintaining lasting successful relationships with our customers begins with offering exceptional quality products, affordable pricing and efficient service that exceeds industry standards. Check out our products page and galleries for the specs on all of the products we carry. As a SEKD dealer, you have the ability to provide great quality cabinetry and products to customers and builders. Our network of dealers is growing and were seeking professional product retailers with resources and skills to represent our products well. Our products offer real wood cabinetry, and are a top choice for remodels of kitchens and baths or new construction. We offer quality, solid construction, easy assembly and beauty. Here at SEKD were in the business of building lasting relationships with dealers and retailers. If becoming a dealer with SEKD interests you, then visit our Become a Dealer page, complete and submit the online Dealer Request form and you will be contacted in a timely manner. We’re more than happy to help you get started on your latest venture. Our competitve prices help you increase your profit while helping your customers save too! Although the kitchen can be one of the most expensive rooms in a home to remodel, homeowners everywhere are choosing to make this valuable investment. Investing in quality cabinetry is one of the most beneficial decisions a homeowner can make when it comes to remodeling the kitchen. To appeal to buyers looking for quality, it is essential to have all wood cabinets that are well built with premium finishes. Our custom-style cabinets provide an upscale appearance that you won’t find at do-it-yourself hardware stores that offer lower quality products. Another key factor homeowners are looking for while doing their research on their remodel is the cost. 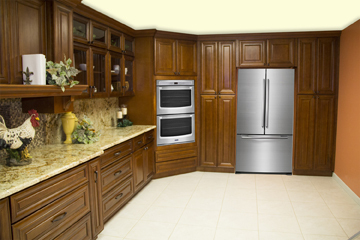 Consumers want to get the highest value possible out of their budget and seek quality cabinetry at reasonable prices. As an SEKD cabinet dealer you have more control in your pricing which allows you to be more competitive. No more paying retail prices for cabinets you then sell to your customers. By eliminating the middle man, you keep more money in your pocket so that you can increase your profit margin and pass along some of those savings to your customers. Here at Southeast Kitchen Distributors you won’t be disappointed. We offer quality products at affordable prices that surpass the competition. That combined with our experience, knowledge and superior service make SEKD second to none. Whether you’re already a dealer or just becoming one, here are some pointers that could be useful for helping customers. Regardless of whether your client’s main priority is to create a kitchen that will appeal to potential buyers or to create a dream kitchen for themselves, a style that will age well and withstand the changing tastes and trends should be chosen. If the kitchen cabinets are not designed in a functional way that provides good flow, it can hurt remodeling efforts more than help. During the planning process it is important that no rushed decisions are made, our associates here at SEKD are available to help you with any questions or advice you may need. Helping clients choose a door color and style that will integrate well with the rest of the home, especially rooms right off the kitchen, is important for creating a harmonious feel and aesthetic appeal. A harmonious home is simpler for prospective buyers to understand since people tend to like clean lines and clean finishes. You want to compliment the home’s architecture, not work against it. The associates at SEKD can help dealers navigate towards the optimal cabinet options that will work best for your clientele’s home and budget. When buyers see that you have spent the extra money on good-quality side rails and quiet-close features, they are more likely to believe you have taken greater care in the entirety of a home and therefore are more likely to make an offer on a new house. Most buyers also prefer drawer and cabinet handles and pulls that are more clean-lined. However, if custom hardware is chosen, it can easily be removed and can be taken when the homeowner is ready to move on to another home or sell, and be replaced with a more streamlined set that will appeal to a broader range of buyers. A recently renovated kitchen or bathroom is definitively appealing to potential buyers; however, it can add little value if it was done solely to a specific personal taste. Classic or neutral colors and styles are going to provide the best potential for resale of a home and return on investment. Our cabinet choices offer class and timeless style, built with the quality to last. Give our friendly associates here at SEKD a call today to get started. We look forward to becoming your #1 Kitchen Distributors!